Bedrooms: n/a "Vary by Cabin"
Bathrooms: 6 "Plus Shower House"
Size: 0 sq. ft. "Various sized Cabins"
Lot Size: 4.7acres n/a "1/4 mile from the main land"
Situated approx. 30 miles north of Hwy 17 at Vermilion Bay with access off Hwy 105. 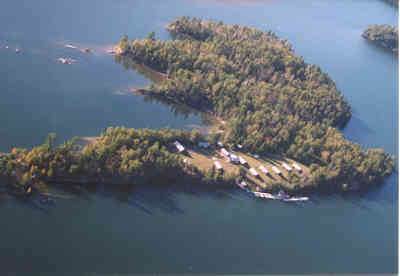 The camp holds a leased location for parking & storage. This is a unique set-up only minutes from shore but allows guests seclusion and privacy. It is serviced with an underground power cable maintained by Ontario Hydro. Renovations have been done throughout the camp including new power lines and septic system. The business is well established with a great clientele base. Our season is from mid May till the end of September. The Main Residence is 1 1/2 storey with new commercial kitchen and adjacent dining room for 24-26 guests. Cabins include eight log units and four frame units all overlooking the water. 9 have 3 piece bath & central shower building for the remaining. There is a storage building on the main land lot. All 12 cabins have full kitchens. Include a minnow storage building, motor storage units & a new fish cleaning building. Fishing is good for Walleye, Northern, Bass, Perch and Trophy Muskie! Inquire for price and terms!